Why did the British government not investigate the Rendlesham Forest UFO case in any depth? This is the briefing paper prepared for Lord David Trefgarne, a British government defence minister, when he had a private, off-the-record meeting in 1985 October with Lord Peter Hill-Norton, a former Chief of the Defence Staff. It explains why the British government never investigated the Rendlesham Forest case in any depth. 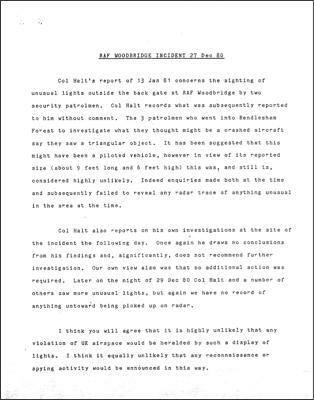 The two-page paper was among documents found in the Ministry of Defence UFO files released at The National Archives in 2008 May. It is pages 115 and 116 of file DEFE 24/1925. Click on each page below for an enlargement (PDF format). The meeting arose after correspondence between Lord Hill-Norton and Lord Trefgarne. A letter from Hill-Norton dated 1985 July 26 in which he lists a number of questions he wished to explore can be seen on pages 208–210 in file DEFE 24/1925. Further copies of the same letter can be found on pages 259–261 and 280–282 of file DEFE 31/174. 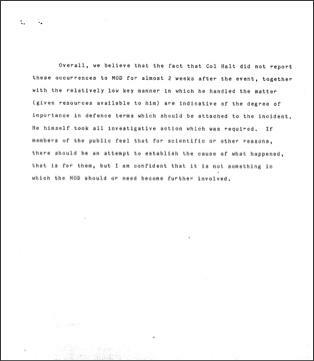 Knowing of Hill-Norton’s reputation as an avid UFO believer and an outspoken critic of the MoD’s “no defence significance” line, Lord Trefgarne wrote “Oh, dear” at the top of the letter. Hill-Norton was clearly not persuaded, and returned to the attack in an aggressive correspondence with the MoD in 2001, released in 2007 under the Freedom of Information Act. Simon Weeden, the MoD desk officer who dealt with the Halt memo, subsequently revealed to journalist David Clarke the background details of the MoD’s cursory investigation which Hill-Norton was not in a position to know. “Those around at the time were not unduly alarmed and did not see this as an incident of great importance,” he told Clarke. Go to this page and search on the name ‘Weeden’.